I was honestly not sure if I should call this recipe a soup or a stew because it’s not as thick as a stew… it’s not as thin as a soup… it’s kind of in between. 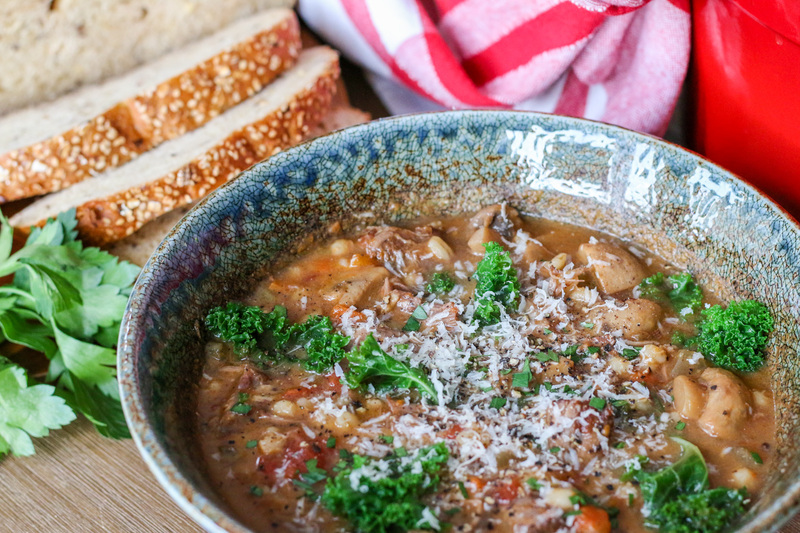 I know some people would call it a stoup, but I wasn’t sure if that was just a made-up cooking term, so I settled on “soup” because my intentions were to make a beef and barley soup… but terms aside, this recipe is filled with lots of beefy yummyness! It also makes quite a bit, so make sure you have a large pot peeps! 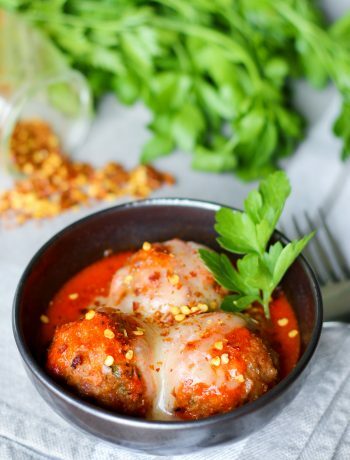 We meal prepped this on the weekend and this lasted the two of us all week and we never got sick of it! This recipe came after we had beef and barley soup at Kev’s parent’s house, ever since then that’s all we have been thinking about. So we had to make our own! I bought a bunch of small packages of simmering short ribs while at the store thinking that it wouldn’t be enough… It wasn’t until I started to brown the meat did I realize that perhaps I did buy too much meat to fit into the pot, but you know what, in the end it worked out p-e-r-f-e-c-t-l-y. 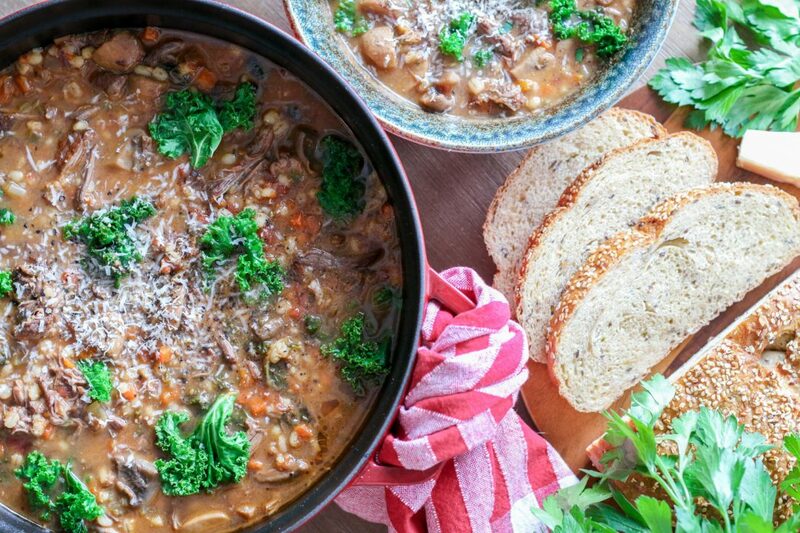 Oh this beef barley soup is soooooo meaty and soooooo good. The secret to flavouring this soup is Better than Bouillon Beef Base. It’s honestly the bomb diggity when it comes to bouillon brands. 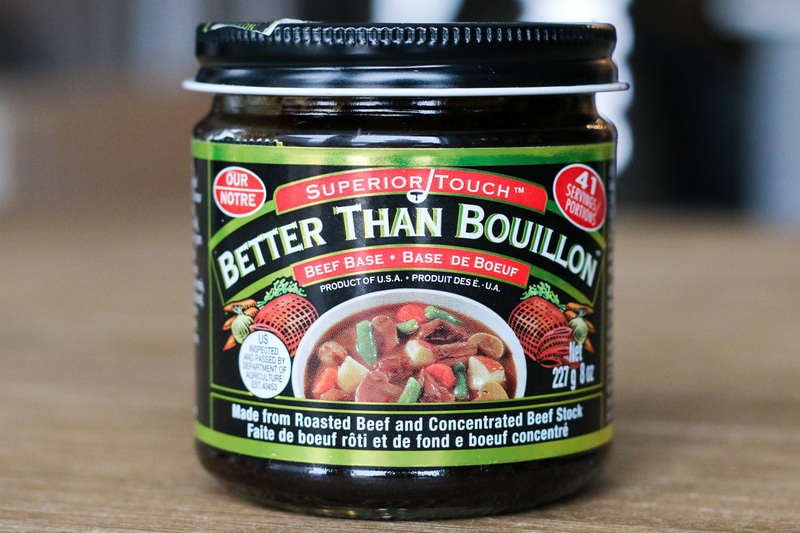 I’ve never been a fan of boxed beef stock or powdered/cubed bouillon, IMHO they are so flavourless. The paste is where it’s at! I didn’t need for any extra salt in the soup as this broth combined with the beefyness of the short ribs was just the right amount. 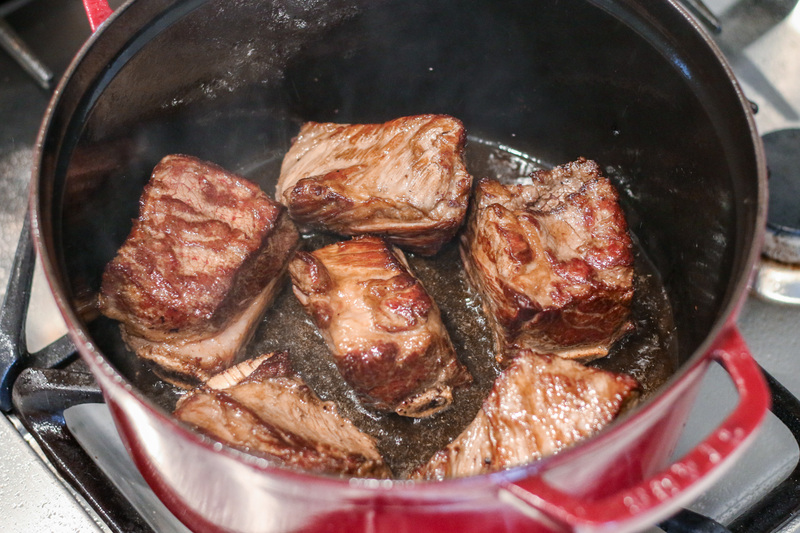 Once you have your beef broth made, you need to brown your meat in hot oil. You’ll know the oil is ready when you just begin to see whispers of faint smoke rising. Then sear, sear, sear away. Look at those juicy chunks of meat. 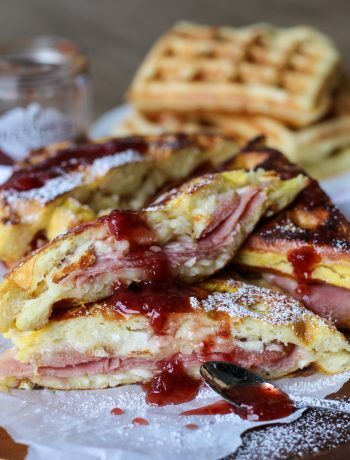 It almost looks good enough to eat right now! Be patient little grasshopper, there’s another 3 hours to go! 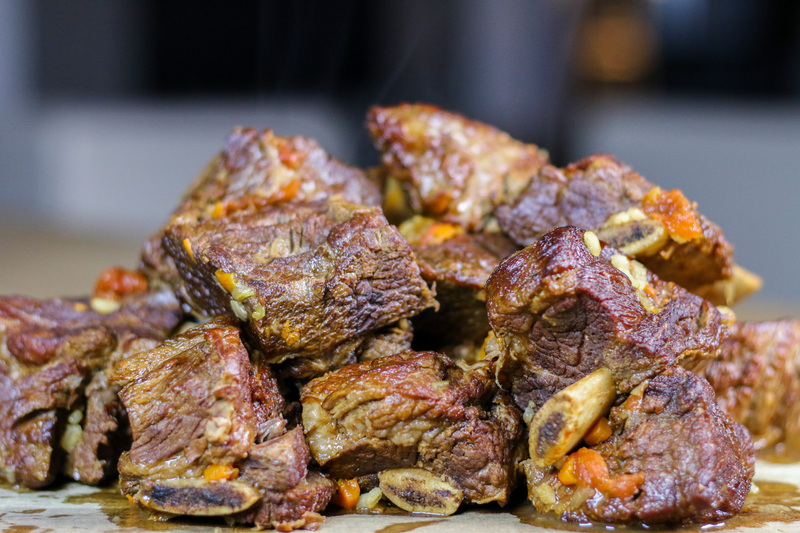 Let those browned short ribs rest on a platter and glisten away while you cook the less appealing vegetables. Yes, folks. This picture is not as pretty as the previous two, but look at how cute those little dices are. You’ll want to cook the veggies until soften and deglaze with a couple glugs of wine… and well you know, you should take a couple glugs yourself. I ain’t judgin’. Next, add those beautiful pieces of browned meat back into the pot, along with some tomatoes, broth, and bay leaves. Then simmer, simmer, simmer for a very long time. Have some wine while you wait until you need to add the barley into the pot. When it’s time, shred away at the fall-off-the-bone tender beef short ribs. Then put it back into the pot of course… along with the kale – we can’t forget about the greens!!! Then wait for it… BAM! 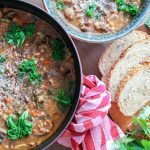 BEEF & BARLEY SOUP! 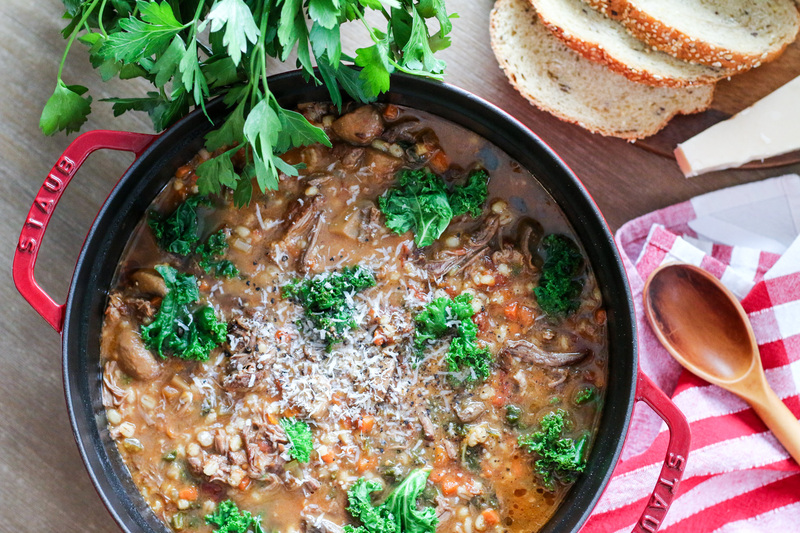 Hearty beef and barley soup with just enough kale to lighten it up. Add water and beef base into a large container and stir until the beef base is dissolved. Reserve beef broth for later use. Coat the bottom of a large heavy bottomed stock pot with oil and place over high heat until the oil starts to smoke. Working in batches, brown each side of the meat, about 5 minutes each side. Place the meat on a tray and reserve for later use. Add onions to the pot and sweat for 3 to 4 minutes. Add garlic and sauté for 1 to 2 minutes. 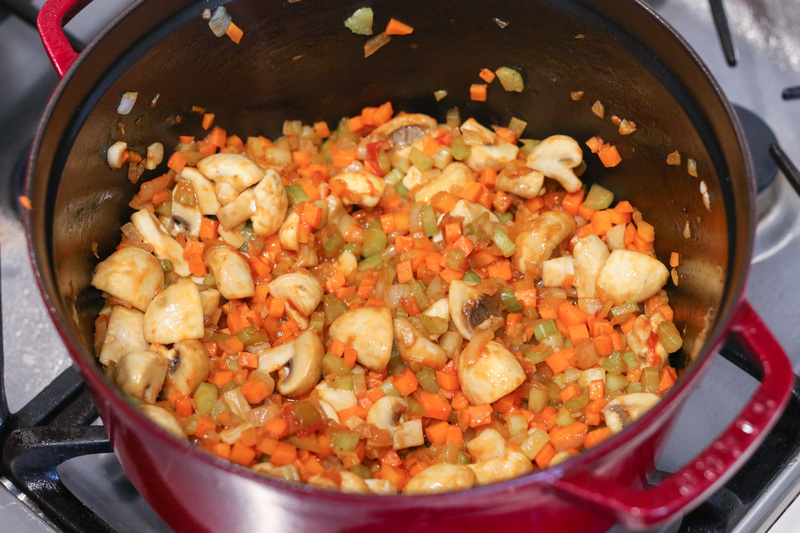 Add carrots, celery, mushrooms, and tomato paste and cook for 5 to 10 minutes until the vegetable mixture starts to brown. Deglaze the pot with red wine and cook for another 5 minutes. Add tomatoes, 8 cups of broth, and bay leaves. 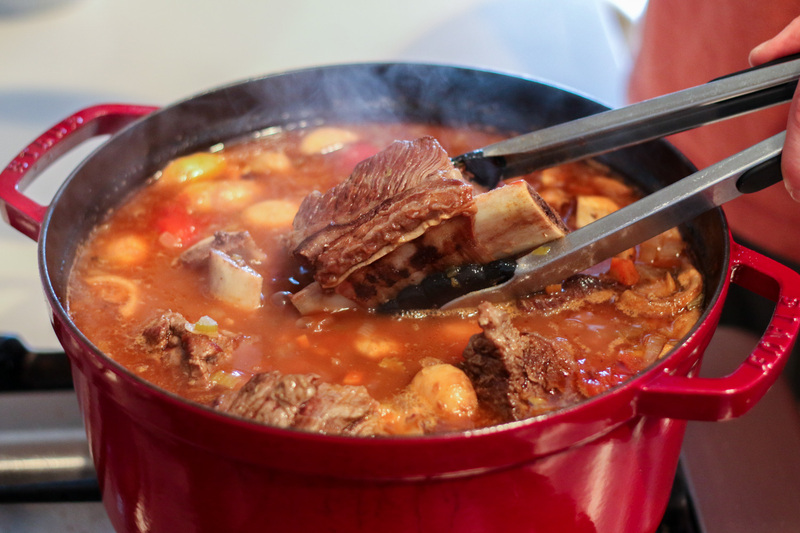 Carefully add the short ribs back into the pot (arrange the meat so it is submerged in the liquid). Bring the liquid to a simmer and cover. Simmer for about 2 ½ hours, every 30 minutes or so agitate the mixture to prevent burning. Add barley and the remaining 4 cups of broth into the pot and continue to simmer for another 30 minutes. After 3 hours of simmering, remove the meat and place on a cutting board. 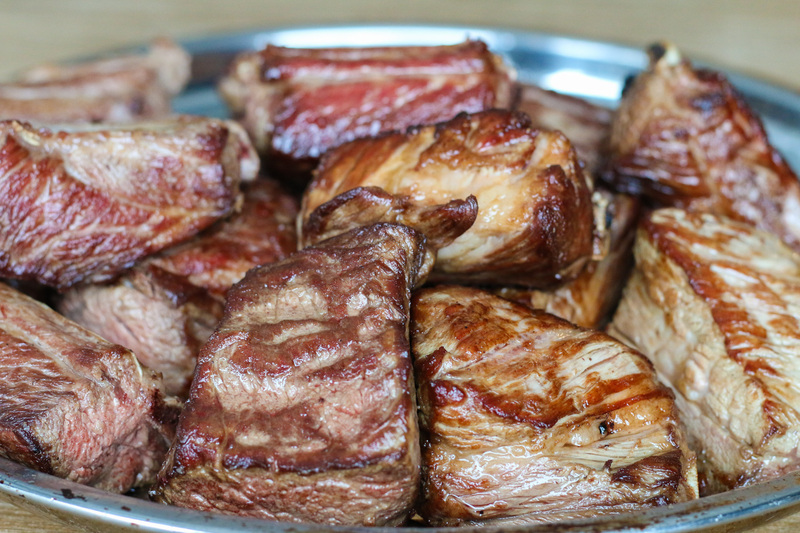 Shred the beef into large chunks and discard bones and any extra fat. Place the meat back into the pot. Stir in the kale and simmer for 1 to 2 minutes or until the kale is softened. Test the soup for additional flavourings such as salt or pepper. 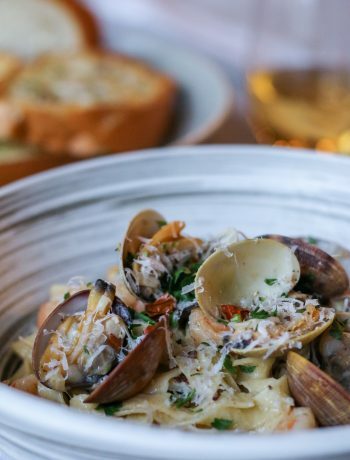 Serve immediately, garnish with finely grated Parmesan, freshly cracked black pepper, parsley, and a nice slice of hearty bread.